Some things are hard to describe in words. In fact, many things are hard to describe in words. Try describing in detail the bedroom you spent your childhood in. My guess is that you will have a hard time describing it well enough for someone else to recreate it. The same is true for new ideas. Words may be a start, but they often lack the precision and clarity required to describe a new idea to someone else. Photos, sketches, and data visualizations can make complex ideas easier to understand and share. That’s why portfolios beat résumés, and young designers are still encouraged to carry a sketchbook. This week, try recording your observations and ideas visually, even if just as a rough sketch in a notebook or a picture on your camera phone. If you think you can’t draw, too bad. Do it anyway. 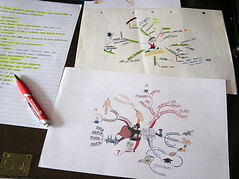 Mind mapping can be an excellent way to get visual about abstract ideas. For example, check out the design thinking mind map used in Change By Design, which you also can see in my recent post, “Start Designing Your Life. There were nearly two hundred likes on this and a discussion had kicked off which seemed fairly one-sided, with 42 people all agreeing with this premise in one form or another. Oddly they had all used words to express this agreement and not one picture could be seen. I respectfully disagree with some of the premises in this article. We think with language – I defy anyone to frame a conceptual thought without it – and human language, at least the ones I know, bases on words. I have looked at Mind Mapping and some of the other inventions of Tony Buzan, I have read several of his books and remain skeptical as to the practical use of them. As far as mind mapping is concerned, its main use in my opinion is to give people of an artistic bent an excuse for doodling in meetings, and at least some direction to the doodling they’d probably be doing anyway. A tabular approach wins out every time – the human brain loves tables and rectangular things. That’s why we live in rectangular rooms in rectangular buildings with rectangular furniture. Placing any problem into a table immediately highlights areas which are uncovered, and ensures deeper and more consistent thinking on any topic. Even “out of the box” thinking is only possible if you’ve defined a box. None of this happens with mind-maps, which ensure a very subjective and random summary of any topic. I thought it was worth taking a contrary position and maybe getting some thought and discussion going, so please don’t be offended at my detraction from your premise, which is certainly not intended in an agressive spirit.